On Tuesday, a dozen new Cherry Hill police officers were sworn in before dozens of family, friends, police and township officials. 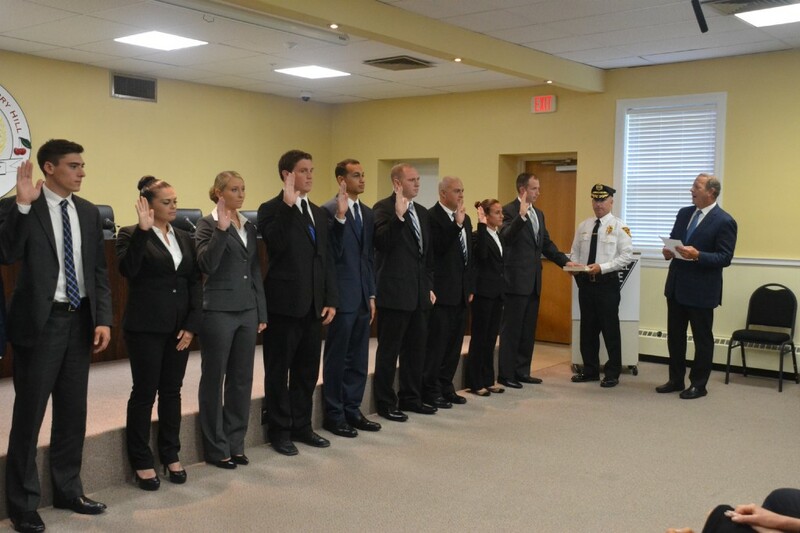 The newest members of the Cherry Hill Police Department are sworn in by Mayor Chuck Cahn and Cherry Hill Chief of Police William Monaghan on Tuesday. 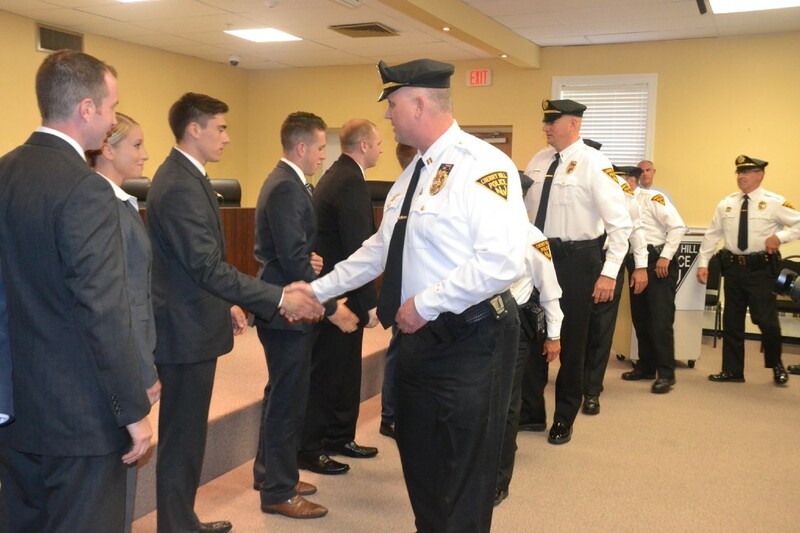 A dozen people from different backgrounds and walks of life emerged from hundreds of candidates and were officially sworn-in as new members of the Cherry Hill Police Department on Tuesday at the Cherry Hill Municipal Building. While all 12 new officers share a passion for law enforcement and serving their communities, Monaghan reminded the audience the new faces of the Cherry Hill Police Department were more than just officers. All of them were unique people as well. The journey to the Cherry Hill Police Department was different for all of the candidates. Pine Hill native Stefanie Short doesn’t have any family roots in law enforcement. However, she admits she has always wanted to become a police officer since she was little. Pennsauken native Joshua Vasquez has fond memories of Cherry Hill Police from when he lived in the township as a kid for a few years. He said these memories helped influence him to apply for a job with Cherry Hill Police. Jordan Mayr has already worked as a police officer for the past two years in Harrisburg, Pa. However, after applying and going through the hiring process in Cherry Hill, he admitted the atmosphere in the town was unlike any other. “The township is very involved, the community, everyone seems to be working together,” Mayr said. 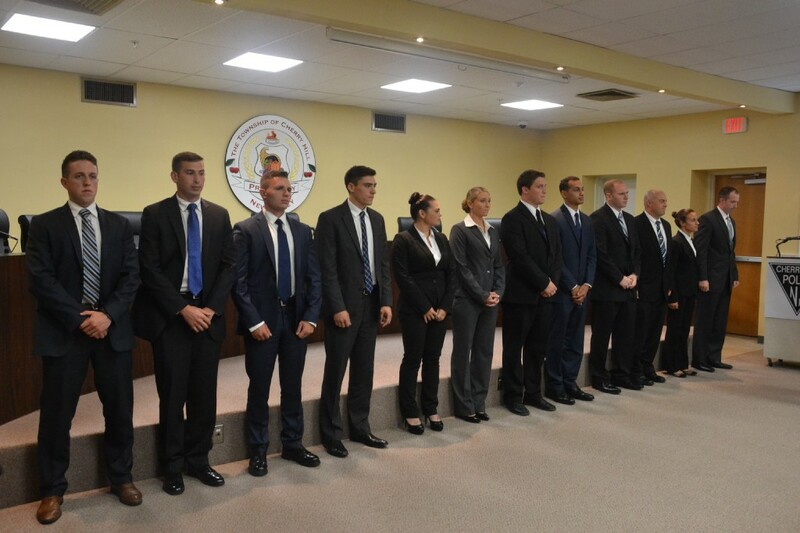 Members of the Cherry Hill Police Department congratulated the 12 new members of the department after they were sworn-in. The hiring process was very long and consisted of three rounds. More than 1,000 candidates originally came in for a written test, with candidates with the best scores advancing to the physical abilities test. The final part of the process was a formal interview and background investigation. Monaghan said the purpose behind the process was to not just find the best officers, but also the best people for the job. Many of the candidates felt this philosophy separates Cherry Hill from other police departments. Mayr was impressed with how well the police department got to know him and the other candidates. The 12 new members of the Cherry Hill Police Department stand before a crowd of family, friends police officers and community leaders. Some of the candidates come to the Cherry Hill Police Department with ties to law enforcement. Vasquez said he was greatly influenced through his best friend’s father, who also worked in law enforcement. Mayr’s father was a sergeant captain with the New York City Police Department and was happy to see the amount of family support he had at Tuesday’s ceremony. Unlike some of her comrades, Short does not have any family roots in law enforcement. However, she hopes her decision to join the police force will start a tradition. “I’m hoping to be an influence for someone else, maybe my kids down the road,” she said.